Sure, mandarins like satsumas and clementines have zipper peels…but sometimes you don’t want to get bits of peel under your fingernails. Or you just want a really cool way to eat mandarins that will totally impress your friends. 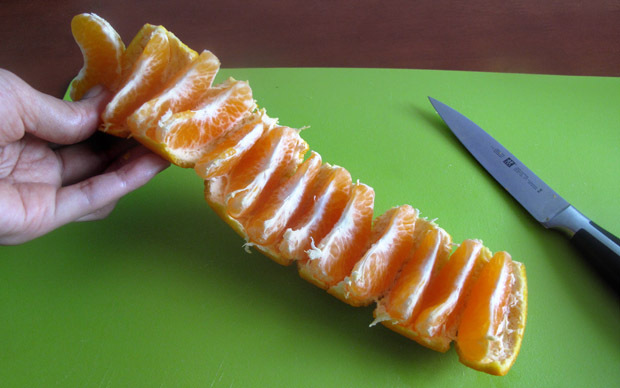 Cut the peel on one side. Don’t cut too deep – just enough to go through the peel and pith. Gently unroll the mandarin until it is in one long strip. It looks pretty and will keep your hands cleaner – a win-win situation. This awesome fruit tip is courtesy of jewelpie.com. Which is your favorite fall fruit in season?